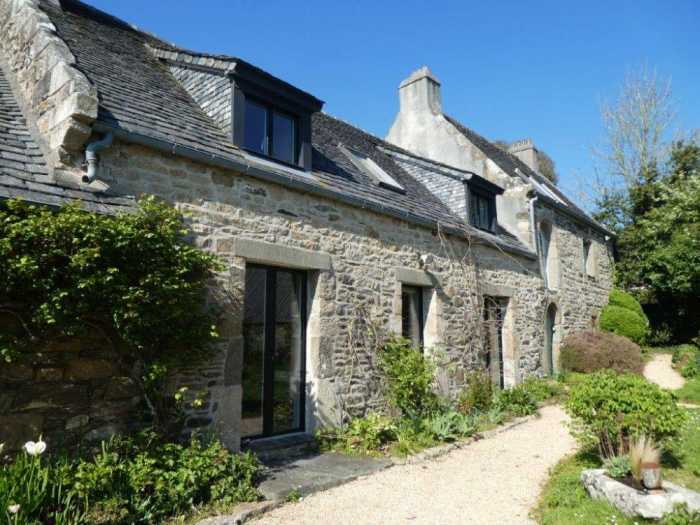 Properties for sale in Brittany, France - AHIB-3-mon1932 Plouezoch Gorgeous 3 bedroomed property with 2442m2 garden - mains drainage! Located in a residential area, in the countryside with shops and beaches just 2 km away, this beautiful property has great charm. It offers beautiful living space of 195 m² with living room (40 m²) with fireplace and wood stove, a large kitchen with fireplace and conservatory on the back, bathroom with WC, study-library of 32 m² with fireplace and mezzanine, boiler room with WC on the ground floor. Upstairs, landing used as a study, 2 bedrooms, bathroom with toilet and storage. Seperate part with access from the conservatory, on the first floor, a large bedroom with fireplace, bathroom with WC and mezzanine. Many outbuildings: storage-storeroom in two sections, carport, workshop-laundry and former kennel. All on a beautiful garden of 2400 m², pleasantly south facing and not overlooked. Loads of features.... fireplaces, original timber, granite floors, beautiful 'country' slate roof.. and immense charm for this long house with some rooms to finish.